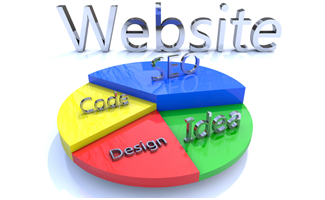 We offer full-service website design for your business. We can create a new design from scratch, or work within your existing design to modify or extend it to better fit your company’s style and circumstances. Even if you’ve never had a site up, we can help you build from the ground up. We can provide you with content management systems (CMS) like WordPress, Drupal, or Joomla so that you and your employees can easily update the website for blog posts, minor updates and changes, and new or additional information. In addition, we can program custom functionality into any website; whether you need a clever widget for your clients to use, or you need a fresh new way to display gallery images or manage orders. We can work with any coding language the web can throw at you, like PHP, ASP, CSS, SQL, HTML5, XML, and jQuery. Your site is useless to you if people can’t find it, and we can make that happen. Search Engine Optimization (SEO) is a total-site process that’s part design, part coding, and part maintenance. We know how search engines work, and how they look to find your site, and we build every design with built-in best-practices for SEO so you don’t have to worry.